Ditch the role of spectator, & become part of the show!™ A unique audience-interactive Entertainment experience guaranteed to WOW! Looking for Interactive Entertainment that's fresh, vibrant, engaging and FUN, and suits any audience, any occasion, any place and time? Afrobeat's Unique Interactive Drumming Show delivers an unforgettable impact! 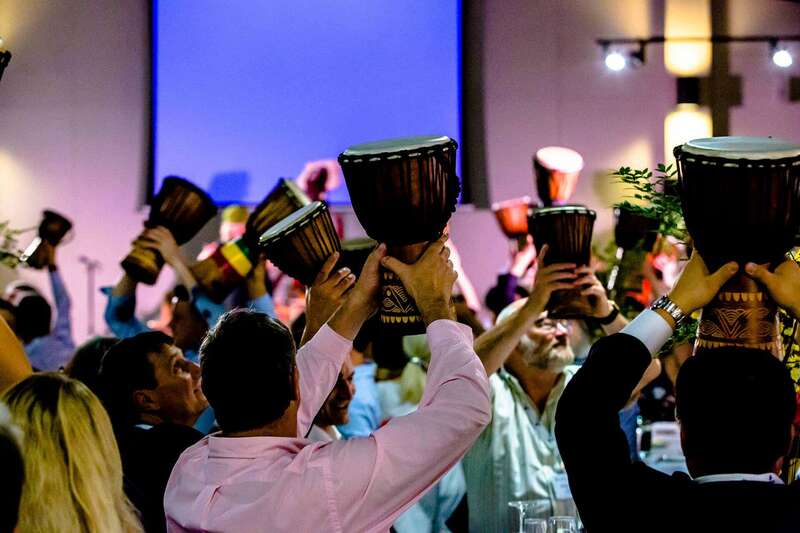 To the delight and surprise of unsuspecting audiences, Afrobeat invite EVERYONE to take up a drum or percussion instrument of their own and join in, or get out of their seats and join our entertainers on stage! A dynamic, colourful and theatrical spectacular, the Afrobeat experience captures the immediate fascination of its audiences. With every beat, enthusiasm and excitement build as the participants begin to realise the power of their individual rhythmic contributions! Before they know it, the unsuspecting audience have become performers rather than spectators and the group dynamic and team spirit begin to emerge. Ask us how our Interactive Drumming Show can be tailored to suit your theme, special occasion, or message of the day! This Company ensured their team went home on a high with a dynamic and interactive conclusion to their Annual Conference & Exhibition. See how we engage and energise 350 tired nurses at the end of a long conference day!